Engineered to securely mount to the side of the helmet, this shield protects the side of your face without obstructing sightlines. A lightweight ABS plastic construction with a padded inner surface means you don't sacrifice protection for comfort. Fielder's Guard offers facial and dental protection with great visibility and sightlines, so there are no obstructions for ground balls. Black Mask (shown). Do not see your color, contact us for all available colors. The Fastpitch Defender's Mask brings sleek, high-impact protection that puts you in control of the game. 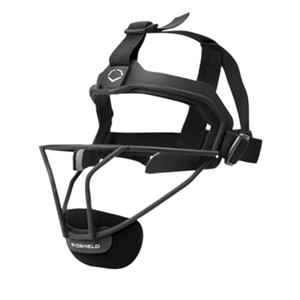 The fully customizable cheek and chin pads flex to your preference, while the straps adjust for a comfortable fit. The mask has a streamlined design with low profile padding to maximize your field of vision. Designed to allow complete flexibility and utilizing EvoShield's patented Gel-To-Shell technology, no other chest protector on the market can match the protection and comfort that the EvoShield Chest Guard will provide. 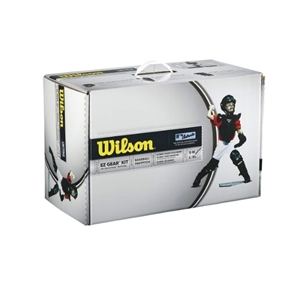 Wilson EZ Gear kit is built with QuickChange technology for easy on-and-off in ten seconds or less. It comes complete with a helmet, chest protector and leg guards. 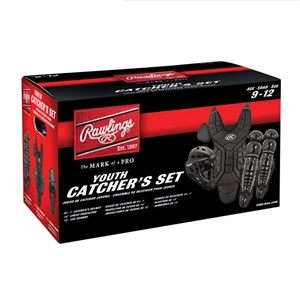 This kit is perfect for the youth ball player. EASTON M3 YOUTH Kit - BLACK ONLY. Youth size fits most 9-12 ages. The new players Series catcher set includes one hockey style catching mask that fits a head size 6 1/2 - 7. 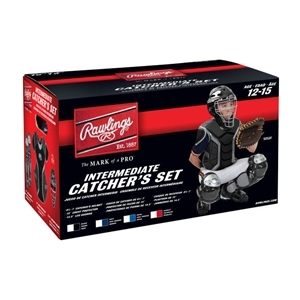 It also includes a pair of leg guards that are 13" and a catchers chest Protector that is 14". the players Series catcher set features ultimate protection and comfort. They also are lightweight and flexible. Recommended for ages 9 - 12. Renegade Series catcher's set features a Coolflo hockey-style helmet, 14 inch chest protector and 13 in triple-knee leg guards. Renegade Series catcher's set features a Coolflo hockey-style helmet, 15 inch chest protector and 14.5 in triple-knee leg guards. Easton's M7 catcher's box set has high-end features like multi-layered foam and strategic ventilation to keep the catcher well protected, comfortable and cool behind the plate.Youth size fits most ages 9-12. Show your prowess behind the plate with Easton’s new PROWESS™ P2 Fastpitch Box Set. Specifically designed for the female athlete, the Prowess P2 Fastpitch Box set features catcher’s gear for players age 11-13. Easton Gametime YOUTH Box Set includes a helmet, chest protector and leg guards. Kit is offered in 4 core color combinations to match your team’s colors. Youth size fits most 9-12 ages.